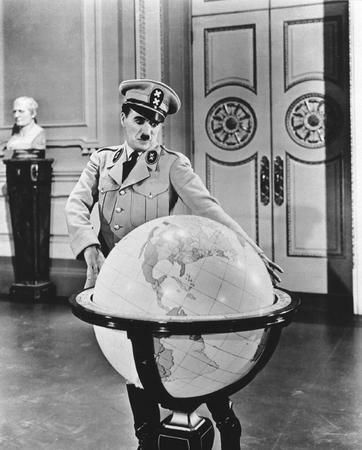 One of the funniest scenes in Charlie Chaplin's The Great Dictator (1940) is the 'Globe Scene', where, inspired by the notion of being "Emperor of the World," Tomainian dictator, Adenoid Hynkel, does a balletic number with a large inflatable world globe. The scene ends with the globe bursting in his face. Globe (with bullet-hole through Germany) displayed at the German Historical Museum. 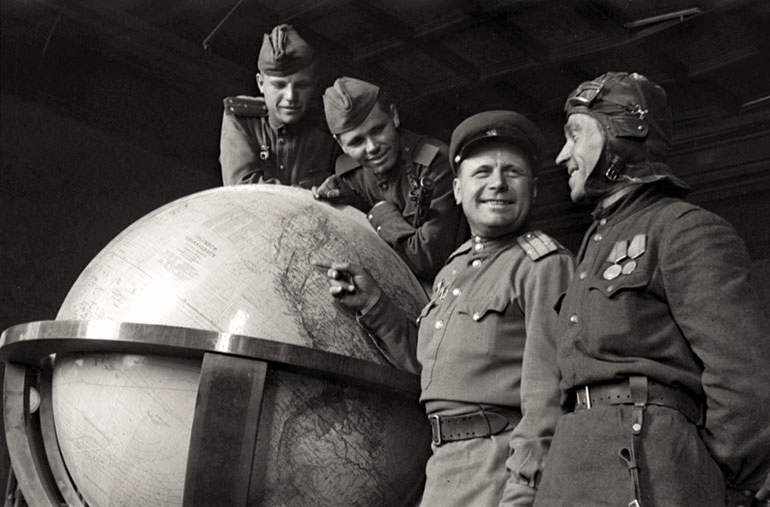 Note different styling of pedestal from the World War II pictures. 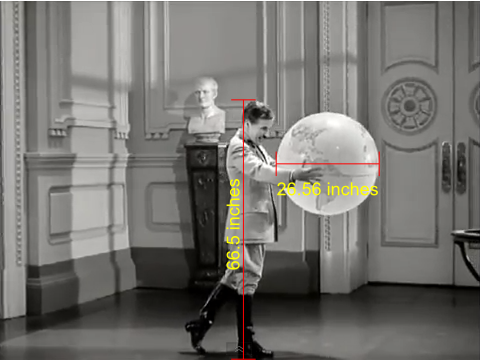 If Charlie Chaplin was really 5 feet, 5 inches tall, and his shoes added at least 1.5 inches to his height (5'6.5" or 66.5 inches), his inflatable globe would have been roughly 26.56 inches (2.21 feet) across – definitely a far cry from the huge globe above. 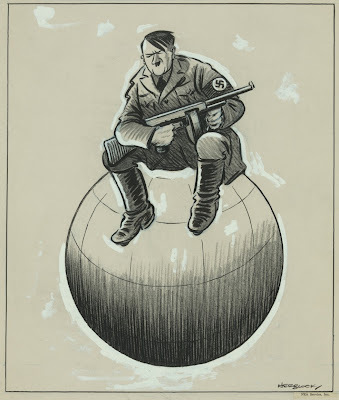 There are talks that Hitler's office in the Chancellery had an even bigger globe – nearly the size of a Volkswagen, says Wolfram Pobanz, but there are no known pictures of Hitler posing with it. 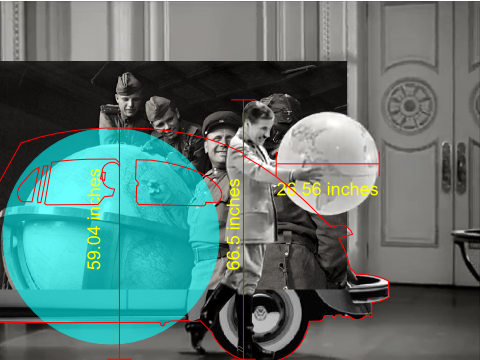 Cabinet Room globe size adjusted so Chaplin's head is similarly sized to the head nearest the German globe. The original Volkswagen's height is in inches. 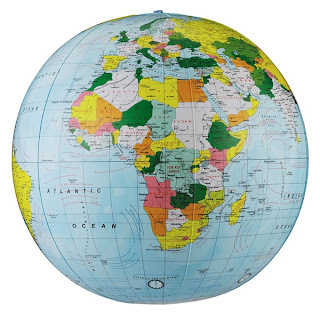 Pobanz thinks the Hitler Globe could be in Moscow. 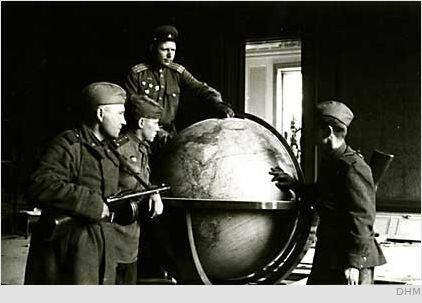 Another story relates that the Cabinet Room globe was said to have been taken by a high-ranking Soviet general to his office at the then USSR (could have been at the Kremlin) and was destroyed through water damage later. But that's just anecdotal. 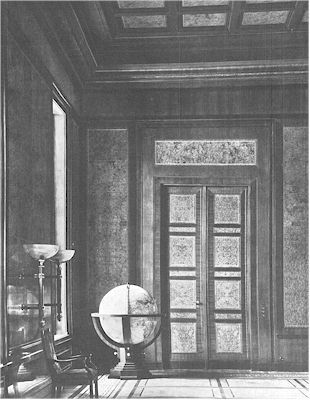 Apparently the pedestal of both the New Reich Chancellery and the Führer globes were of similar construction – "sharp-cornered, stepped wood base" according to Pobanz (the 'stepping' is seen in the first picture of the Cabinet Room globe in the New Chancellery), which is different from the base of the globe displayed at the German Historical Museum. Globes made for top Nazi officials were called "Columbus Globe for State and Industry Leaders" but records of how big Hitler's globe was, if ever there was one, was destroyed with the Columbus company's archives in 1943. Then there's the desk globe taken as war booty in 1945 by John Barsamian from the Eagle's Nest (Hitler's mountaintop retreat) near Berchtesgaden, Germany. 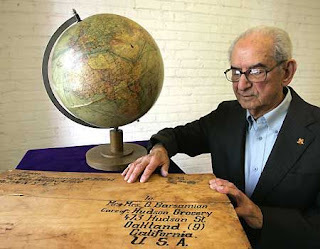 This globe was put up at auction and sold to Bob Pritikin in 2007 . 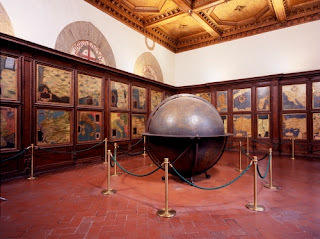 A replica of this globe was shown in the Tom Cruise movie Valkyrie, prompting speculations of a copyright suit coming from Bob Pritikin. I doubt the feasibility of such a lawsuit. Wrangling over relics left by someone responsible for the murder of millions is as full of air as Chaplin's inflated balloon globe. 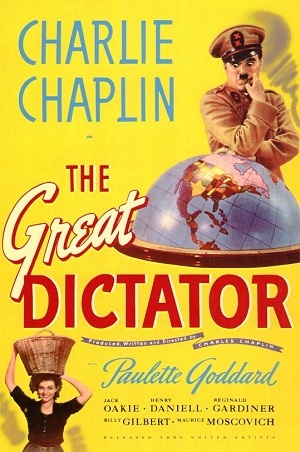 At 27 inches across, this is the closest in size to Charlie Chaplin's The Great Dictator globe (12 and 16-inch sizes are also available). Unlike Chaplin's globe, this will not easily burst in your face. Meher Baba describes the globe bursting scene as symbolic of greed and its consequences, the dictator's "desire to possess the world destroys it in the process." When the Russians entered Berlin after Hitler's suicide they found the actual room upon which Chaplin's set was based. Everything in it was destroyed by bombing, the ceiling caved in, dust everywhere. 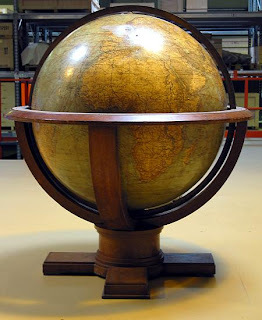 But miraculously this globe, depicted in a prop in Charlie Chaplin's film, was unscathed, the sole thing remaining in the room. Symbolically speaking, God had saved the world itself. Wanting to possess a model of the world is one thing, wanting to possess the actual world is another.